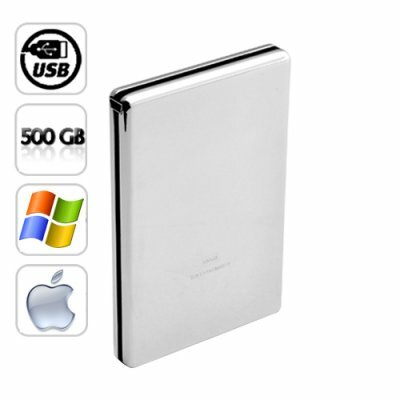 Successfully Added Portable External Hard Drive (500GB, Silver, PC and Mac) to your Shopping Cart. This portable external is perfect for: Professionals, business travelers, college students, freelancers, designers, web developers, downloaders, teenagers, or anyone who wants an affordably compact and stylish, yet powerful mobile storage solution. Brought to you by the leader in factory direct wholesale electronics, Chinavasion. For PC and/or Mac computers! What file formatting system should I use if I want to use this external HDD on both my PC and Mac computers? For dual systems, we recommend using the FAT32 system to format the E91. Quick delivery to The Netherlands! Great product! on 2010-06-23 16:04:14 perfect buy! The perfect buy, it's beauty an really usefull :) the size is awesome, it's not so big.